Airsoft Innovations grenade oil is medium viscosity oil which provides a ideal lubrication for Tornado Grenade operating components. Significant lifecycle testing has shown that AI supplied grenade lubricant provides optimal consistency and durability for our Tornado Grenades. Unfortunately this lubricant does not have an easily sourced substitute. R/C car shock oils were initially tested and found to provide poorer lubrication than our oil sourced from an industrial supplier. Maintaining your Tornado Grenade with AI grenade oil is easy: drip 2 drops into a grenade piston opening before resetting your valve. 2 drops every other fill provides sufficient maintenance for your Tornado Grenade. AI Grenade oil now comes in a new easy-squeeze, super clear bottle with a recloseable cap – no loose cap to lose. 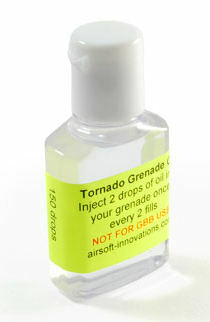 It is included in every Tornado box, contains 50 ml or ½ oz oil, enough for 150 grenade uses. 50 ml is enough oil to last for many grenade lubrications at 2 drops every other filling. 50 ml provides 150 drops which is good for 75 lubrications which works out to a crazy 150 throws.